This is a quick summary and illustration of the connections involved in the ZeroMQ based IPython cluster for parallel computing. 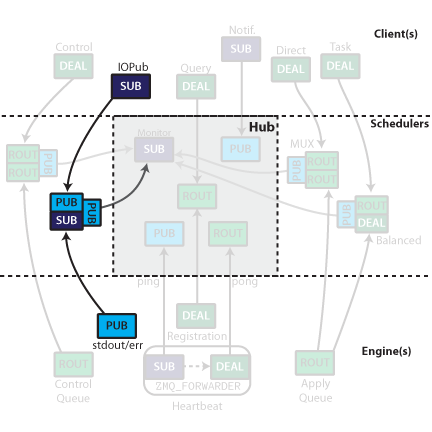 The IPython cluster consists of a Controller, and one or more each of clients and engines. The goal of the Controller is to manage and monitor the connections and communications between the clients and the engines. The Controller is no longer a single process entity, but rather a collection of processes - specifically one Hub, and 4 (or more) Schedulers. It is important for security/practicality reasons that all connections be inbound to the controller processes. The arrows in the figures indicate the direction of the connection. 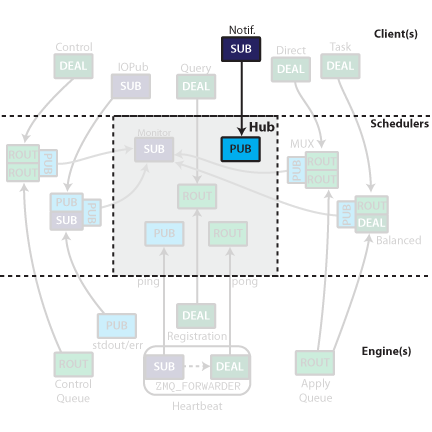 All the connections involved in connecting one client to one engine. The Controller consists of 1-5 processes. Central to the cluster is the Hub, which monitors engine state, execution traffic, and handles registration and notification. The Hub includes a Heartbeat Monitor for keeping track of engines that are alive. Outside the Hub are 4 Schedulers. These devices are very small pure-C MonitoredQueue processes (or optionally threads) that relay messages very fast, but also send a copy of each message along a side socket to the Hub. 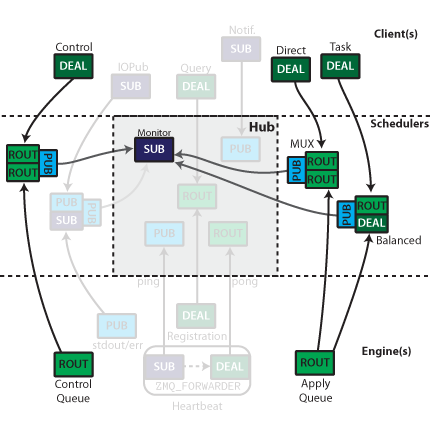 The MUX queue and Control queue are MonitoredQueue ØMQ devices which relay explicitly addressed messages from clients to engines, and their replies back up. The Balanced queue performs load-balancing destination-agnostic scheduling. It may be a MonitoredQueue device, but may also be a Python Scheduler that behaves externally in an identical fashion to MQ devices, but with additional internal logic. 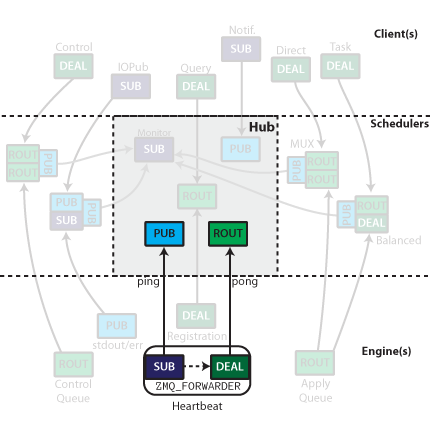 stdout/err are also propagated from the Engines to the clients via a PUB/SUB MonitoredQueue. 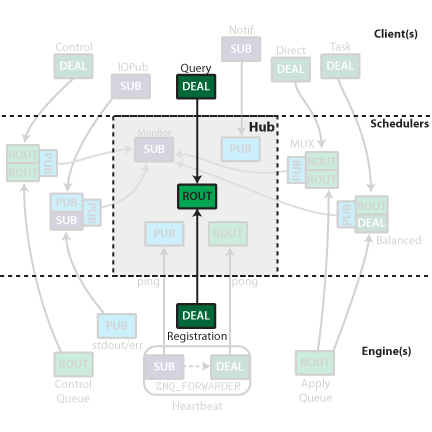 Engines and Clients only need to know where the Query ROUTER is located to start connecting. Once a controller is launched, the only information needed for connecting clients and/or engines is the IP/port of the Hub’s ROUTER socket called the Registrar. This socket handles connections from both clients and engines, and replies with the remaining information necessary to establish the remaining connections. Clients use this same socket for querying the Hub for state information. The heartbeat process has been described elsewhere. To summarize: the Heartbeat Monitor publishes a distinct message periodically via a PUB socket. Each engine has a zmq.FORWARDER device with a SUB socket for input, and DEALER socket for output. The SUB socket is connected to the PUB socket labeled ping, and the DEALER is connected to the ROUTER labeled pong. This results in the same message being relayed back to the Heartbeat Monitor with the addition of the DEALER prefix. The Heartbeat Monitor receives all the replies via an ROUTER socket, and identifies which hearts are still beating by the zmq.IDENTITY prefix of the DEALER sockets, which information the Hub uses to notify clients of any changes in the available engines. Control message scheduler on the left, execution (apply) schedulers on the right. The controller has at least three Schedulers. These devices are primarily for relaying messages between clients and engines, but the Hub needs to see those messages for its own purposes. Since no Python code may exist between the two sockets in a queue, all messages sent through these queues (both directions) are also sent via a PUB socket to a monitor, which allows the Hub to monitor queue traffic without interfering with it. For tasks, the engine need not be specified. Messages sent to the ROUTER socket from the client side are assigned to an engine via ZMQ’s DEALER round-robin load balancing. Engine replies are directed to specific clients via the IDENTITY of the client, which is received as a prefix at the Engine. For Multiplexing, ROUTER is used for both in and output sockets in the device. Clients must specify the destination by the zmq.IDENTITY of the ROUTER socket connected to the downstream end of the device. At the Kernel level, both of these ROUTER sockets are treated in the same way as the REP socket in the serial version (except using ZMQStreams instead of explicit sockets). Execution can be done in a load-balanced (engine-agnostic) or multiplexed (engine-specified) manner. The sockets on the Client and Engine are the same for these two actions, but the scheduler used determines the actual behavior. 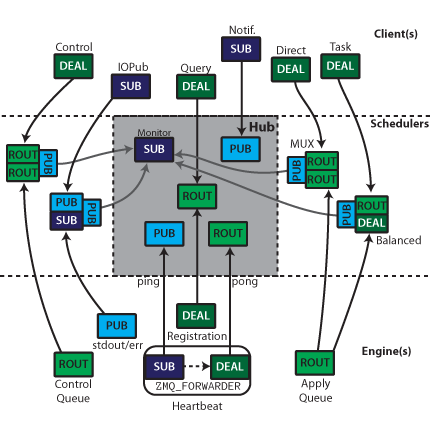 This routing is done via the zmq.IDENTITY of the upstream sockets in each MonitoredQueue. On the kernels, stdout/stderr are captured and published via a PUB socket. These PUB sockets all connect to a SUB socket input of a MonitoredQueue, which subscribes to all messages. They are then republished via another PUB socket, which can be subscribed by the clients. Clients connect to an ROUTER socket to query the hub. The hub’s registrar ROUTER socket also listens for queries from clients as to queue status, and control instructions. Clients connect to this socket via an DEALER during registration. Engine registration events are published via a PUB socket. The Hub publishes all registration/unregistration events via a PUB socket. This allows clients to stay up to date with what engines are available by subscribing to the feed with a SUB socket. Other processes could selectively subscribe to just registration or unregistration events.